Defender was developed by famed designer and programmer, Eugene Jarvis (he would later co-found "Vid Kidz"). Defender wasn't an initial success due to its extreme difficulty and complex controls (five distinct buttons and a joystick). 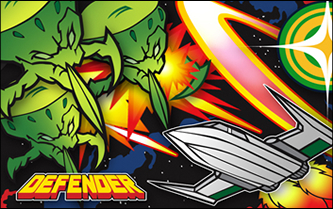 However, as time went on Defender became very popular among arcade-goers and was often used to measure the "true skill level" of a gamer. In Defender, the player controls a spaceship that flies horizontally along a mountainous landscape firing a beam-like weapon at aliens. The basic goal is to rescue "humanoids" from waves of invading aliens, each possessing a different set of skills. "Lander" aliens can capture humans and turn them into "Mutants". If all of the humans are captured (or shot accidentally) the mountainous surface disappears and all "Landers" are converted to "Mutants" making the game even more difficult than before. I found Defender much too difficult to play as a kid. In fact, I don't know if I really ever understood what the objective of the game was until I played it on the Atari VCS/2600. Today, the challenge that Defender presents is the reason that I enjoy it so much. Its fast-paced gameplay and extreme difficulty limits my games to a couple of minutes each. It is that challenge that keeps me coming back, time and time again, trying to improve my score. I had been scanning Craigslist for a Defender for quite a while with no success. So, when I found a local Defender for a decent price on eBay I snagged it. To be honest, I may have overspent a little and probably should have waited. The game itself was said to be "working" but when I got it home I found that it would reset (if it booted at all). After doing a bit of research I found that the errors were most likely do to bad RAM chips or a flaky power supply. I purchased a "Williams Power Supply Repair Kit" and a "4116 to 4164 RAM adapter" (with 4164 RAM) from Bob Roberts. With those items installed, my Defender is booting fine and no longer resetting.